I recently got two calls about interpreting soil tests that had been done by labs outside the state - Massachusetts and Wisconsin. They aren't bad labs, but the results have problems. The problem is that these labs typically run analysis on acid soils and use different extraction procedures than are used on our calcareous soils. The numbers, other than pH, were funny, odd. So I suggested using one of the California labs listed below. The analysis for pH in the results is probably good. pH is probably the most important chemical property of the soil and knowing that and managing it will solve most nutritional problems found in many California soils. Nitrogen and potassium would be handled with leaf analysis. This series of articles will provide a basic guide in understanding the results of a soil test and how it may help in making orchard management decisions based on information provided in them. Soil Testing Labs appropriate for California soils. 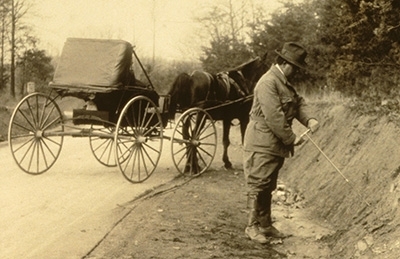 Photo: soil testing has been around and still works, if you know what you are doing.